I'll just get straight to the point! There's more than 1000 followers on my blog! YAY! I would have never have thought that I'll get this far. It has been a great experience. Oh and I also would like to take this time to mention a few bloggers that helped me in the early stages of blogging! And also Thanks to all you awesome people for following... This is such an amazing thing! And so I'm hosting a giveaway and it's massive. There's going to be FIVE prize packs, yes you've heard me FIVE!You can enter all the prize packs so you don't have to worry! And oh yes, there's going to be 8 winners so there's more of a chance to win! - ONE ENTRY PER PERSON! May the odd be ever in your favour! Congratulations on the followers! That's really wonderful! And thanks for the great giveaway! Such a generous giveaway! Thank you and congratulations on 1,000 followers!!!! congrats on the followers!! thanks for the giveaway! 1000 followers is amazing well done! Great swag in your giveaway it looks amazing- fingers and toes crossed. "May the odd be ever in your favour!" And thanks a lot for this amazing giveaway! Wow! Congratulations! 1000+ is a really great achievement:). Congrats on 1000+ followers! It's amazing, and such a lovely giveaway too! Woohoo! Congratulations on all those followers! And thank you for the great giveaway! Congratulations - this is such an incredibly generous celebration - thank you so much. AWESOME!!! congrats for getting 1000 followers!! Congratulations on the 1000 followers!! :D And thanks so much for the amazing giveaway! Congratulations on reaching a milestone and more power to your blog!! Congrats on all the followers :D Thank you for this amazing giveaway! Wow..this is...the craziest giveaway ever! who-uh! *fingers crossed* thanks! Congratulations on reaching 1000+ followers! 1000 followers is a ton! Congratulations! Glad to be a follower! Thanks for a crazy awesome giveaway! This is an awesome giveaway! and your guys rock for doing it:) congratulations on the 1000 followers, that's such a great milestone. Wow! 1000? Awesome! Congrats! <3 and Thanks for the giveaway! Awesome giveaway...congratulations!!! I was just wondering what you meant though about comment on any of reviews, the last question on the form? This is a super awesome giveaway! Congrats on 1000+ followers! Thanks so much for the giveaway! I hope your going to reach 2000 followers soon ! Congrats for reaching 1000 followers!! Thank you for this awesome giveaway! Thanks for the awesome giveaway and congrats on all the new followers! Congrats and thanks for the giveaway. New Follower. Super awesome giveaway! Thanks for sharing! Congrats on 1000...wishing you many 1000's more! Thanks for the fantastic contest! Wow, congrats on +1000 followers!! Huge milestone, and thanks for the HUGE giveaway! You have a Morganville bag!!! I want it. All the books are awesome too. Congrats on the followers - Awesome!! Congrats on the super big follower #'s Wow what a great set of prize packs....I can'r believe your SWAG pac.....Love it!!!!! Here's hoping for the big win!!!!!!! congratulations over a 1000 followers, I just became a GFC its a great blog you have here. that is some prize pack lots of wonderful reads. Have a good one Alba. You're the most generous blogger I have ever met. I love you're reviews so much, you're now my go to blog to see if I really want that book hehe. Thanks for the great giveaway! It's so kind of you! Congrats on reaching 1000 followers, be proud of that! Great giveaway and congratz on the followers reached! Congratulations on so many followers! :) And thank you so much for such a fantastic giveaway. 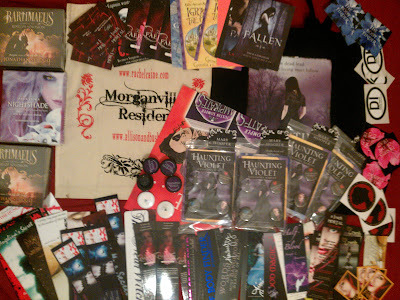 Your giveaway is the most awesome one I had ever seen hahaha I don't think someone had givenout so many books out.... all of them look awesome. Congrats on the 1000 followers, i can't even imagine having that many. Congrats on followers and thank you so much great giveaway! Congrats Mia! Wow I hope to get those many followers in near future ;) That's totally awesome! CONGRATS ON 1000 FOLLOWERS! and thanks for the giveaway! Thanks for the great giveaway. I'm glad you've reached 1000 followers. It's a huge achievement. COngratulations!! Congratulations on all those followers! Congratulations for your 1000 followers! Beautiful giveaway, really! Congratulations! Thank you for this great giveaway! Wow Massive people coming here!. I´m join too, congrats for the 1000 followers and next more 4 sure. Congratulations on the 1000 followers! Congrats on your 1000 followers. That is awesome. I hope to one day have 1000 as well. :) WTG!! One of the most awesome giveaway I've ever seen!! Great giveaway!!! Lots of those I haven't read yet, so it would be great to win! Congrats on your fantastic milestone! I absolutely love your blog. Thanks so much for the opportunity to win books in this contest! Congrats on reaching a 1000 followers and thanks so much for this awesome GIVEAWAY! Congrats on getting so many followers. Wow, you've got almost 1,400. This is a fantastic milestone for you! Congrats - I'm sure it took a lot of hard work to get you here. *does the happy dance for you* Thanks for the awesome giveaway also. Awesome giveaway, thanks for making it international! congrats on the +1000 followers. thx for the chance to win. Hi:) Thanks for the great giveaway! I filled out the form a while back but have since completed 2 more of the additional entries. Can I fill out the form again with those extra entries or can I just post them here? Thanks for this fantastic giveaway and congratulation! I must admit, I almost stopped breathing when I saw those prize packs. So amazing! Thank you for your generosity and awesome blogging, Mia. Laura @ A Work of Fiction. Mia this giveaway falls into ROCKSTAR status. Thank you for your tremendous generosity. This giveaway is awesome, thank you so much!! Congrats on the +1000 followers! Thanks for the awesome and very generous giveaway! I'm a new follower and look forward to seeing what you have to say. Congratulations on 1000+!!! Congrats on getting the 1000 followers! Thanks for the giveaway. I hope the odds are in my favour too! Wow 1000 followers, Congrats. Thanks for the giveaway. Haha! I really hope the odds are ever in my favor this time. Congrats on 1000 followers! That's a lot of people! And thanks for making this giveaway international. This is so so awesome! I'll probably never win this. But well. no harm trying to get Vanish or The Unbecoming of Mara Dyer or Bloodlines! Aaaah.. Terrific giveaway!! Congratulations on the big 1000!! congrat on the 1000 followers ! I so do love books. Yay! Thanks for an awesome giveaway! And congrats on your awesome milestone!! Nooooo! It can't be too late!! I've just found you! Like two ships that have passed in the night, we've been lost in the fog of much blogging and rapid reading, it seems. Nevertheless, I'm your newest follower and will take any crumbs from the table of your prolific pile of books in the near or far future. Best of luck to all who entered here. Luscious Limelight: A Book Bloggers spotlight!